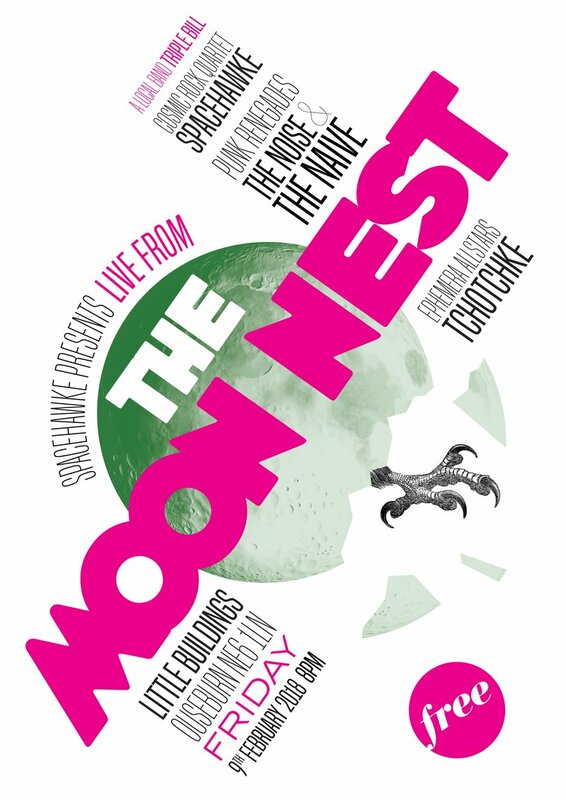 On Friday 9th February, fuzzy, indie rock noise makers Spacehawke present Live from The Moon Nest – a free showcase of local bands at Little Buildings in Newcastle’s Ouseburn Valley. The showcase features Spacehawke themselves, with their synth inflected sounds and mesmerising melodies a great starting point for an eclectic bill of bands each offering up something different. The Noise & The Naive are a raw, rough, roaring pop-punk duo from Newcastle. Featuring drummer and singer Anne and guitars from Pauline, there’ll be a raucous, vivacious energy added to the bill. Tchotchke round out the trio of bands with gorgeous dream pop that has already been bringing in much acclaim. For a showcase of talent, you’d be hard pressed to find more shining examples of what the North Easy music scene is doing very well. Spacehawke, The Noise & The Naive and Tchotchke play Little Buildings, Newcastle on Friday 9th February.